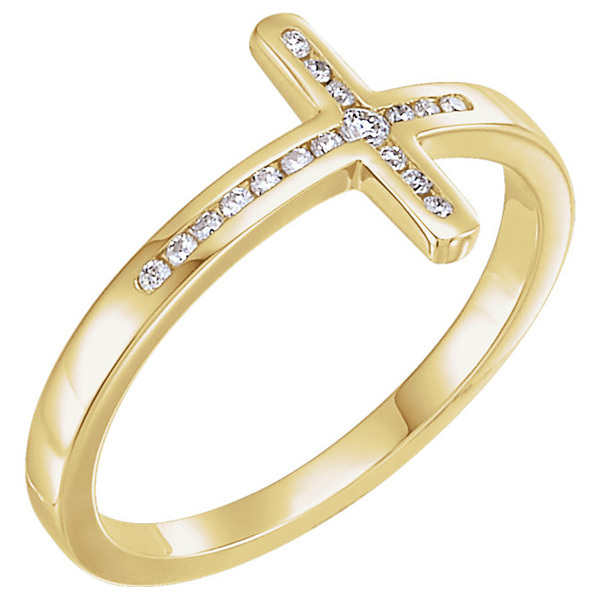 This women's diamond cross ring in 14K gold from Apples of Gold Jewelry is a stunning, elegant cross ring that combines the soft beauty of yellow gold with the sparkle of diamonds. This stunning ring features a cross on top of the ring in an all one piece style. The ring measurements graduate from 2.3mm at the shoulder to 1.8mm at the base. At the top of the ring, two additional arms reach out from the sides, forming a cross, which has seventeen diamonds. The diamonds total 1/10 carat of diamonds (0.10 Carat), and are rated G-H for color and I1 for clarity. We guarantee our Women's Diamond Cross Ring in 14K Gold to be high quality, authentic jewelry, as described above.